Have you ever thought of photography as a spiritual journey? Photography provides a way to still the heart and soul so you can hear God's voice and sense God's presence. Whether you're an experienced photographer or just take pictures with your smartphone, you will enjoy this creative way to connect with God. In Meditation on Both Sides of the Camera, award-winning photographer Valerie Isenhower guides you to pay attention, center, and focus your eyes in new ways. 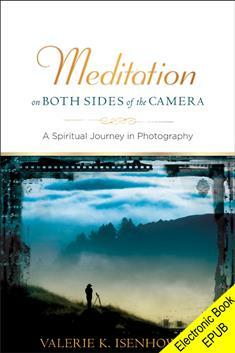 "The spiritual journey of photography from beginning to end is like breathing life into the stories of our photographs and souls," Isenhower writes. Take advantage of Isenhower's years of experience as enjoyed by others in her workshops and online courses.